Last weekend I took the train back up North for a much needed relax on my home turf. A few weeks before hand I was lucky enough to receive a super exciting little package in the form of alcoholic beverages. If you’ve ever seen a tweet of mine then you’ll know that I’m a huge gin and prosecco fan. But something that you might not know is that I’m actually a bit of a whiskey fan as well. I have to admit that I was more of a whiskey fan a few years back and now I’d rather opt for a G&T as my Friday night beverage of choice. That being said, when the team at uOpen got in touch about a whiskey subscription box by The Dram Team I was incredibly intrigued. 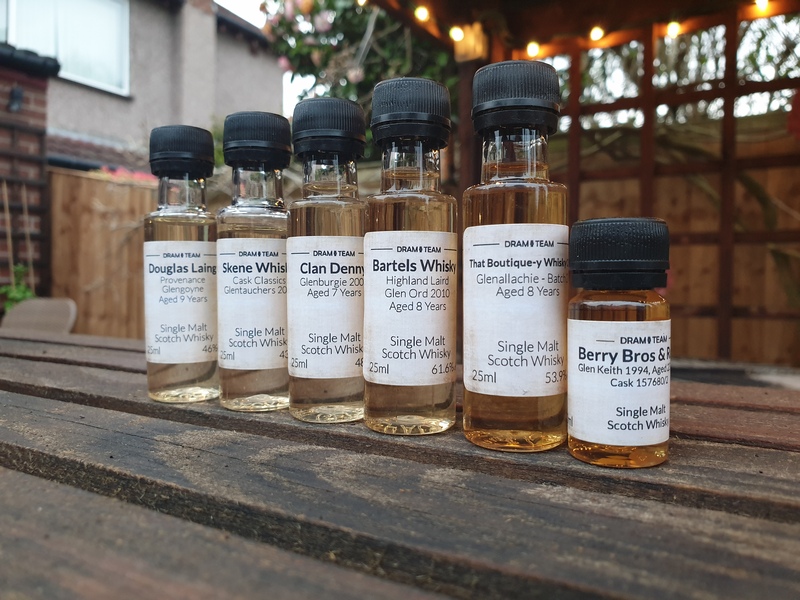 So flash forward a few weeks and I was heading back home with my whiskey samples in hand (well…suitcase) ready to test them out with my nearest and dearest. I thought sharing the experience with my family would be a lot more fun than testing them out myself. Plus it’d give me an array of different opinions for the post! None of us are whiskey connoisseurs but we are all fans of the drink so we were happy to test them out and give our honest opinions. We wanted to really make a proper experience of the tasting so we decided that writing down our thoughts would be a great idea. We started by smelling the whiskey, then tasting it and then reading about it afterwards. The idea was to do a blind tasting and form our own opinions first. Afterwards we could check what was actually inside them and see how we did! Honestly, it was so much fun testing them all out and super interesting to hear each others opinions. So, lets get on with it. The items in this post were kindly gifted to me by the team at The Dram Box. All opinions are my own. Taste: smooth, initial lightness, then more depth. Clean and pure, reminds you of christmas. What we were supposed to get from it: Fresh, fragrant and fruity with soft vanilla. Sweet with white chocolate, butter and layered with fruit. Medium-long before becoming dry and orangey. Smell: like a sherry, sweet and orange. Taste: nutty (walnut, acorn, hazelnut). Orange, almond with a lingering taste. Potentially cinnamon as well. What we were supposed to get from it: Honey and cinnamon with a touch of oak. Vanilla and sugar with an after flavour of cashew and peach. Spices that stick around for a good long while afterwards. Smell: light, perfume-like, floral – heather, stronger scent when put into a glass, intoxicating. Taste: caramel, syrup and spice. What we were supposed to get from it: initial freshness before developing into vanilla. Macerated fruit, sweet spices and cloves. Medium-long finish with a herbal quality. Smell: citrus, lime, vanilla and honey. Taste: strong, maybe should add water to it, caramel, cake, spicy, fruity, raw and powerful. What we were supposed to get from it: smokey with intense oak, gooseberry, lime and barley. Honey and apple as well. Hints of apricot and straw. Long, juicy and vanilla’d finish with spice and fruit. Smell: floral, light, botanical and sherbet. Taste: like a brandy, orange, cointreau, oak and honey. What we were supposed to get from it: crisp orchard fruits, ginger, sherbet lemons. Nutmeg, ginger and leather. Lingering spice and hints of burnt toast. Smell: honey, bourbon, smokey, sweet, caramel. Syrup, leather and toffee apple. Taste: lavender, honey, clove/star anise. What we were supposed to get from it: aromas of wood glue and furniture polish. Lime zest, apples and boiled sweets. A finish that lingers of vanilla pods, nutmeg and stewed apples. How did we do overall? As a whole I’d say for amateur whiskey drinkers (is that even a term?) we did a pretty great job. I’m pretty impressed at how well we picked out some of the flavours and scents in each whiskey. Even if sometimes we didn’t pick up on them! If I was to choose one for myself it would definitely be the first whiskey as it just felt a little bit lighter than the rest. For anyone who is looking to try out a whiskey for the first time I think the Douglas Laing would be a great start. Thanks again to uOpen and The Dram Team for letting me try out some amazing whiskeys. It was such a fabulous experience and a mother’s day to remember for all four of us! Are you a whiskey drinker? What are some of your favourites? I’m on the fence with whiskey, although I really enjoyed the whiskey tasting at the Irish Whiskey Museum in Dublin! I love the idea of being sent through ‘tasters’ to do your own tasters at home. It would be great for a small gathering/party too! Think the caramel tones sound delicious in a few of these.